Duluth, GA is home to a wide variety of wildlife including squirrels, skunks, bats, rodents, opossums, and raccoons. While they may be just fine in the park or in the woods, they may not be as welcome on your property or in your home. As humans have developed the area, we have taken over their natural habitats which places them in the same areas that humans inhabit. The problems usually start when they get in the house. Professional wildlife removal in Duluth, GA can help you get wildlife out of your home and keep it out. Face it, squirrels and raccoons are pretty cute. Even skunks are pretty adorable – from a distance. For many people, they equate “cute” or “adorable” to “harmless.” Unfortunately, those cute critters are anything but harmless. A squirrel in your attic can do significant damage including chewing your wires and damaging your electrical system. If pets or children come in contact with the animal, they could be injured. 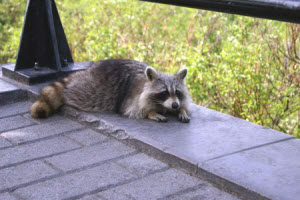 Wildlife can also introduce pests like mites, fleas, and ticks into the home. In short, the wild animals are best left outside. The GA laws for nuisance wildlife removal are fairly strict; so, attempting to get rid of wildlife on your own is probably not the best idea. You could get injured or find yourself in legal trouble with DIY wildlife removal. Professionals will remove the wildlife as humanely and safely as possible with an emphasis on minimizing risks. What’s more, they can also provide helpful tips for preventing wildlife from returning to your home or property. They can tell you how they are getting in and why. This can go a long way in managing the problem in the future. For wildlife removal in Duluth, GA, call the professionals at North Fulton Pest Solutions and get the job done right. Wild animals in your home pose a serious safety and health risk. They can also cause your property value to plummet. Removing the animals yourself can be a risky, dangerous task. A trained, licensed nuisance wildlife technician will remove them while remaining compliant with Georgia laws. Call today to schedule a home inspection so one of our knowledgeable technicians can help you get rid of nuisance wildlife and prevent them from coming back.